How true it is to say that Nature is everywhere. This morning, it appeared in the form of a caterpillar on my colleague Danny’s desk, apparently dropped from a plant pot. Amused by the unusual find, we spent a while observing its action. While it seemed to be moving quite a bit initially, it totally stopped after that. We thought it must have realised it was on unknown ground, hence the need to tread carefully. But the inactivity was just way too long. I dug out some information I took note earlier on the care of caterpillars and saw this, “Put in one fresh leaf both in the morning and the evening” . It must be hungry, I thought. 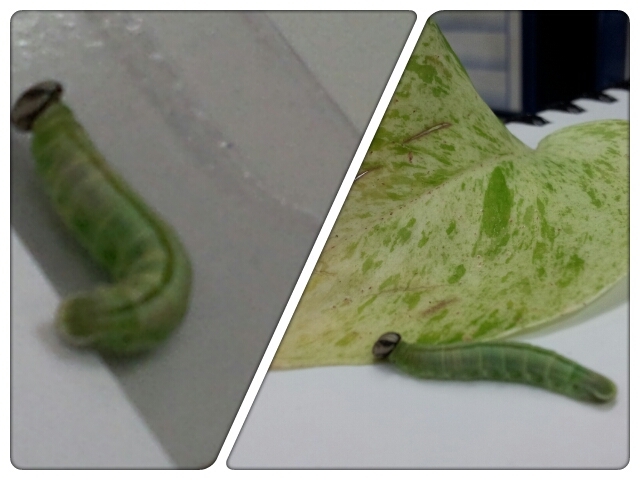 Danny sacrificed a leaf from his pot of money plant and offered it to the tiny green creature, but despite showing some initial interest through more active wriggling of its body, we didn’t really observe any action that looks like feeding. Nor was it very interested to be on top of the money plant leaf. We waited. But there was hardly any significant movement. Before lunch, Danny used the leaf to transport the caterpillar to the centre of the money plant pot, but the next thing I saw when I came back was the tiny creature perched on the edge of the metal pot (and not moving). Somehow, it seemed not interested in the money plant. Maybe the leaf is too hard for it to chew? Anyway, I did the “kind soul” act by putting it back to the money plant again, and offered a drop of water onto that leaf. Seriously, I have no other idea whether I am making the situation worse for it. For all we know, it might have used that one hour of effort trying to get out of the plant. I guess we better leave it to the experts on this! Calling all caterpillar experts! SOS! Caterpillars are usually very ‘host-specific’, meaning that they feed only on one kind of plant. Their mother would have known that when she laid her eggs, and would have chosen the correct plant. But once a caterpillar is removed from that plant and carried away (eg into an office…), it won’t find its own way back. Quite a heavy responsibility, isn’t it. Guess it’s a race against time then… Thanks Andy!